One of the most photographed cats the “Tiger” though can trigger a rush of adrenalin, but what if you are one of those who think “Been there done that”? You empty your pockets doing the flurry of game drives in Indian parks at times paying a premium with special all zone access to venture out in the scorching heat of the cruel Indian summer only to be faced with scenes which are dull and boring, forget adrenalin rush your body produces melatonin, inducing sleep…..so much so for a tiger safari then. We as photographers are constantly looking for tiger action in the form of hunts, play sequences, interactions or shooting the cat in the soft morning or evening light. These are rare moments and happen once in a while. But what do you get instead on 70% of the occasions? Tigers sitting in cemented water tanks, Tigers in the bushes, Tiger sleeping under tree shades. The subject you go out seeking is smarter than you , they give you an half opened eye look with a perplexed look as if saying go chill in a swimming pool , sit in the shade, it’s too hot to be cooking yourselves alive. Summer sightings like these are considered to be below average owing to harsh light or man-made structures and the drooping shoulders of a lot of camera owners around me just display signs of what I term as “tiger boredom”! Over the years I have been bitten by this boredom way too often but have tried to come up with ideas to overcome it by experimenting with such tiger sightings. We all start off with shooting tiger portraits, some graduate to learning how to zoom out and capturing the majestic feline in its environs, some never do. It’s after all the world’s most photogenic cat. But in a scenario where you can’t do much with the environs have you thought of doing an extreme portrait of the cat. Stacking up all the glass in your kit for a tight close up of the eye if it’s open, or the nose or experimenting with the depth of field by keeping certain parts of the face in focus and blurring the rest. IMHO these are some engaging exercises that can keep you engaged while your body cooks itself, making the stepping out in the sun a little more worthwhile. From head to tail the tiger is by far a charismatic subject and as a photographer I see frames and perspectives in every part of its body. What better than a lazy tiger sitting out in the open to hone your observation skills. Stripes, paw, powerful back hunches, nose, whiskers – each and every body part of the tiger has a hidden image which is fun to explore. Never went to a Zoology practical class, try that out with your camera and lens on the most majestic subject available. We crib about our cities being a concrete jungle but then we encounter concrete in the jungles too, what a bummer that’s what you ran away from to begin with. Tigers in cemented water tanks has become a critical national problem for photographers. The joy of a sighting simply evaporates in minutes with the sight of a cement. Even I didn’t pick up my camera many years ago to photograph something which isn’t natural. One fine summer around 6 years ago, I noticed something during one of my safaris in Bandhavgarh which changed my thought process. Extreme portraits are of course an easy way to deal with the cement issue, but what else can be done. What caught my eye was the trail of water dripping from the belly when the cat got up from the water and ever since I have been thinking of images around the belly waterfalls. Cement water holes have a unique feature. Before the tongue of a tiger touches these water bodies the water is still and the stillness gives a mirror like reflection and there are plenty of opportunities which can be explored around reflections. Even once the process of water going in the system is on, the ripples in the water can create some great tiger abstractions. So the next time you spend a bomb to venture on a full day safari in peak summers risking a sunstroke , don’t doze off to give the sleeping cat company. Tigers have been widely photographed in today’s time but in my opinion there are tons of tiger images yet to be taken. Make the best of what you have, challenge your brain cells, trigger those creative juices and make the adventure out in the sun worth your while. I always wonder that when you as a photographer pick your camera to shoot say a spotted deer a lot of thought goes behind that image. You take the pain to place the deer properly in the frame, you experiment with compositions. Why does that happen? It is just because you consider the deer as a subject. Yes subjects like tigers are rare to find but the moment you get a control on your mind and start treating them as subjects you will end up maximizing your field productivity and make best use of the opportunities that nature presents in front of you. Have you ever tried pondering on the following points? Removing your eye from the view finder to see the subject with your naked eyes and scan for elements which can be added or removed from the frame? You may be using the biggest prime lens in the world that will give you a razor sharp image. However are those sharp images needed every time? How about experimenting with varied focal lengths to create 4-5 different images of a moment as simple as a tiger sitting under a tree. I got hold of the new and revamped Canon 100-400mm IS2 and rested my Canon 70-200mm f2.8 IS2. I used it extensively in Ranthambhore throughout last week. 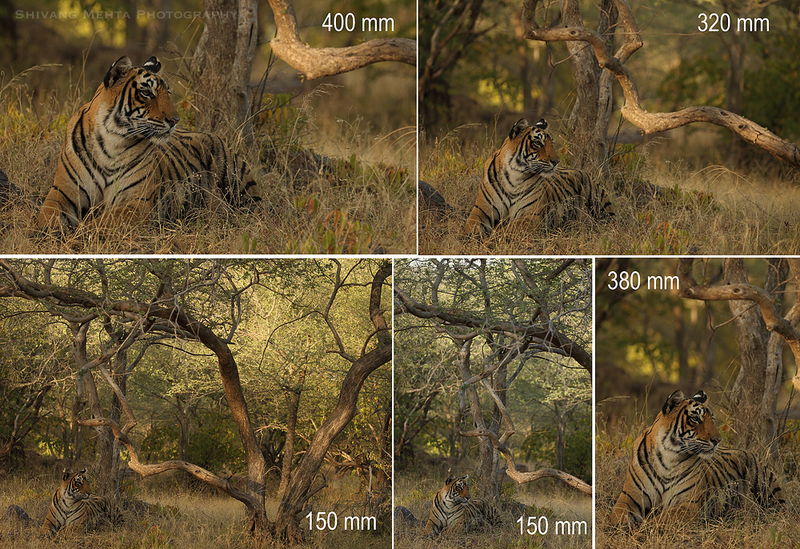 Here is an example from Ranthambhore where a tiger sitting under a tree was shot in 5 different ways as varied focal lengths.